When you're hunting for the best defense to start on your fantasy football team you're looking for sacks and turnovers. Sacks and turnovers start with QB pressure, without pressure on the quarterback you team defense won't produce points. 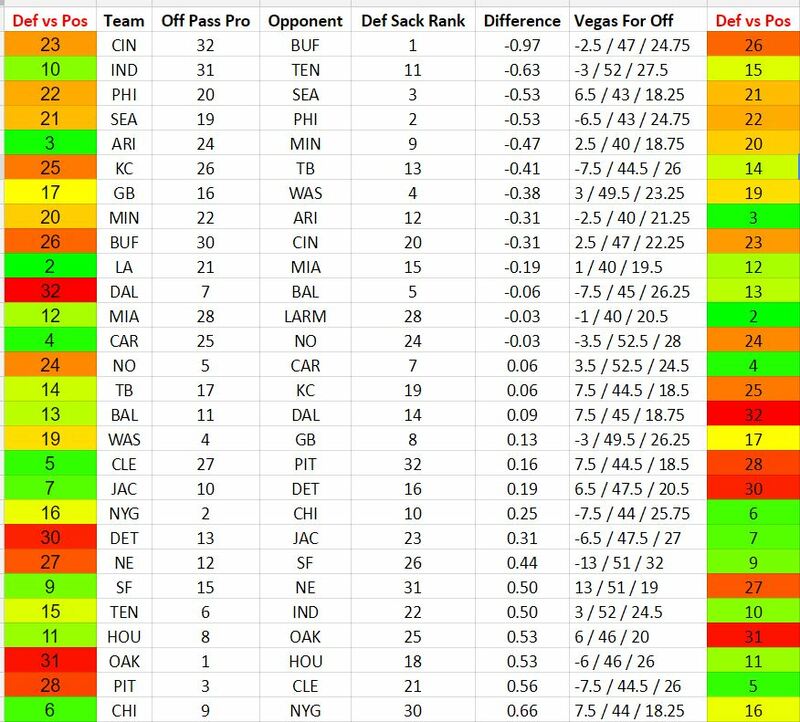 My pass protection chart below is designed to help you identify the best offensive line vs defensive line match-ups this week. Don't forget to use my defense vs receiver heat map to select the best options on offense. And no article is complete without a link to our DFS optimal lineup tool. The "difference" column is what I'm sorting on. The highest negative number indicates that a team defense that is getting a lot of QB pressure is facing an offense that allows a lot of QB pressure. But the "difference" column alone isn't the only thing I look at. Now we want to look at fantasy points allowed by an offense to opposing defenses. This is the first column. Using the chart below as an example, Cincinnati is ranked 23rd in fantasy points allowed to opposing team defenses. Not what I'm looking for when I'm picking a DST but it does make me ponder A.J. Green's ability to get deep this week. I'll also look at the implied team total and over/under when picking a DST. Cincinnati is getting 2.5 points with an implied team total of 24.75, which is also not what we're looking for when picking a DST. While Buffalo has a strong difference, or sack rating, the other numbers just don't look as promising. SEA: Not a big surprise here. They have the third best DST sack rating and Philly is projected to score around 18 points. I think the rookie QB is about to get mowed down. TEN: They have the second best rating but the Vegas Odds scream steer clear. MIN: Not a surprise here. Arizona is projected to score about 18 points and they allow the 3rd most points to opposing team defense. WAS: I'm not falling for WAS again. There numbers look good each week but I just can't trust them at this point in the fantasy season. MIA: Feeling froggy? The Dolphins are average in sacks for and the Rams are more than below average in sacks allowed. I just don't see rookie Jarad Goff having success versus a decent Dolphin defense. KC: Even those the rating (difference) isn't great, the other numbers look good.